Not only were Factory Orders down for the eighth time in nine months, last month's rise in core capital goods was revised away. Chalk up another miss for economists. The Bloomberg Consensus estimate was -0.1% in a range of -0.6 to +1.5% with the actual report at -0.4%. Factory orders fell 0.4 percent in April for the 8th decline in 9 months, a depressing streak interrupted only by March's revised gain of 2.2 percent, a gain inflated by a monthly swing higher for civilian aircraft. There are significant downward revisions to the durable goods side of the report that was first published last week, with durables orders now down 1.0 percent vs an initial decline of 0.5 percent. Capital goods in that report looked strong, but not with today's revision with orders for non-defense capital goods sinking 0.3 percent vs an initial and very strong gain of 1.0 percent. 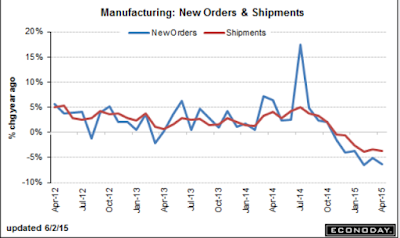 Ex-transportation, orders are unchanged, well down from the 0.5 percent gain in the durable goods report. Nondurable goods are a positive offset in today's report, up 0.2 percent and reflecting strength for chemical products. 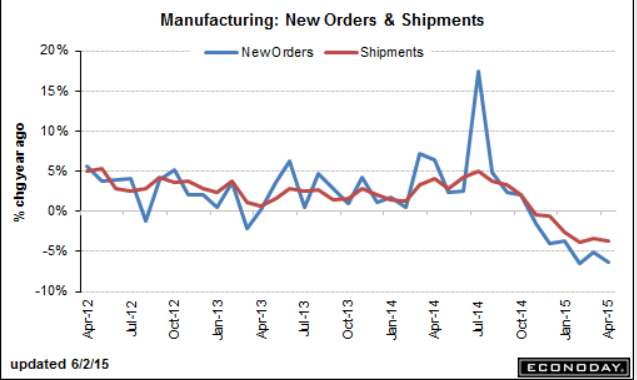 Outside of new orders, data show no change for shipments and a 0.1 percent dip for unfilled orders, both very weak. The lack of punch is putting pressure on inventory levels where the inventory-to-shipments ratio rose to 1.35 from 1.34 in March. The downward revision to core capital goods orders is a setback, pointing to much less business optimism than first reported. The factory sector did not get any lift at all coming out of the first quarter, reflecting weak exports and trouble in the energy sector. Manufacturing employment has understandably been very soft with the next update part of Friday's employment report. Inventories of manufactured durable goods in April, up twenty-four of the last twenty-five months, increased $0.8 billion or 0.2 percent to $401.6 billion, unchanged from the previously published increase. This was at the highest level since the series was first published on a NAICS basis in 1992 and followed a virtually unchanged March increase. Inventories of manufactured nondurable goods, down eleven consecutive months, decreased $0.2 billion or 0.1 percent to $247.4 billion. This followed a 0.3 percent March decrease. Chemical products, down six consecutive months, drove the decrease, $0.4 billion or 0.4 percent to $81.5 billion. Another weak month and another miss by economists. The allegedly transitory weakness continues for 9 months.